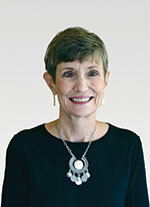 Margaret (Peg) Smith is a Professor Emerita at University of Pittsburgh. Over the past two decades she has been developing research-based materials for use in the professional development of mathematics teachers. She has authored or coauthored over 90 books, edited books or monographs, book chapters, and peer-reviewed articles including the best seller Five Practices for Orchestrating Productive Discussions (co-authored with Mary Kay Stein). She was a member of the writing team for Principles to Actions: Ensuring Mathematical Success for All and she is a co-author of two new books (Taking Action: Implementation Effective Mathematics Teaching Practices Grades 6-8 & 9-12) that provide further explication of the teaching practices first describe in Principles to Actions. She was a member of the Board of Directors of the Association of Mathematics Teacher Educators (2001-2003; 2003 – 2005), of the National Council of Teachers of Mathematics (2006-2009), and of Teachers Development Group (2009 – 2017).